Born, Jakob Izaakszoon van Ruysdael, in Haarlem, the artist was an influential landscape painter in the 17th Century. He came from a family of landscape painters, including his father Isaak van Ruysdael (Isaak de Goyer) and his uncle Salomon van Ruysdael (1602 – 1670). He was also influenced by another Haarlem landscape painter, Cornelis Hendriksz Vroom (1591 – 1661) and may have studied with the Dutch landscape artist, Nicolaes Pieterszoon Berchem (1620 – 1683) and the artist, Allart van Everdingen (1621 – 1675). Ruysdael was well known for his lavish depictions of clouds, and the effects of light through them. He also gave exquisite detail to his depictions of trees, such as his 1646 work, Landscape with a House in the Grove or his 1652 piece, The Great Oak; a piece once thought to be by Berchem. 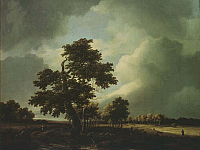 His piece now in the Uffizi Gallery, Landscape with Shepherds and Peasants, exemplifies his cloud formations towering above magnificent trees. He traveled with Berchem to the German border, from where they executed a number of landscapes showing the Castle at Bentheim. Kren and Marx from the Web Gallery of Art (www.wga.hu) note Ruysdael’s naturalistic, though not necessarily accurate representations of the Bentheim Castle are contrasted to Berchem’s inspired fantasy like depictions. There are several of his works capturing sweeping coastal scenes and the artist may have also traveled to Norway, as evidenced by paintings. The Grove Dictionary of Art, documents nearly 700 paintings and 100 drawings in Ruysdael’s body of work. His influence was far reaching into the Romantic era of the 18th century, finding praise even later from great minds such as Goethe (1749 – 1832). His name was sometimes spelled Ruisdael.